WOW!!!!! Very opulent yet elegant gold edition filigree Venetian masquerade mask. The Nera Ora is made from glamorous golden colour laser cut metal with genuine Swarovski crystals for luxury embellishment. 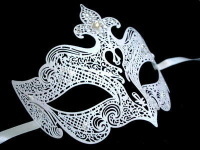 An extravagantly designed and handcrafted ladies metal mask that will tranform any event in to a fairytale night. 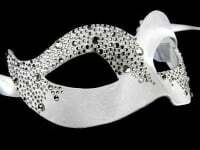 With traditional soft satin ties for maximum comfort the mask is perfect for your next masquerade ball, wedding, prom or venetian party.